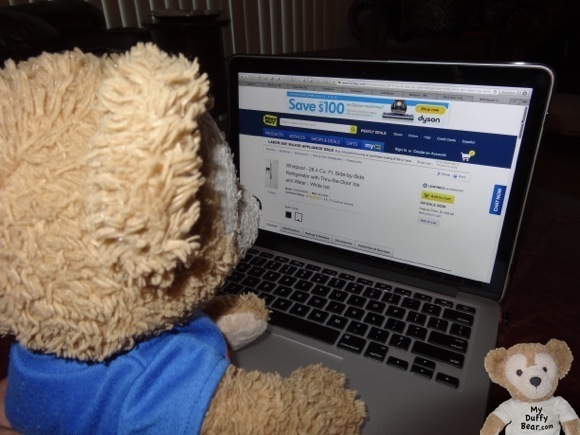 Labor Day Surprise for Duffy the Disney Bear! Labor Day Surprise! I Get to Do What? We’re getting a new refrigerator! Wow…… Who knew getting a new tummy yummy food keeper cold and frozen machine (A.K.A. Refrigerator) would be so much fun! Bad news… I had to opened up my big stitched mouth and ask mommy if there was anything that I could do to help. Well.. actually…..she really didn’t have an evil grin on her face or rub her hands together. 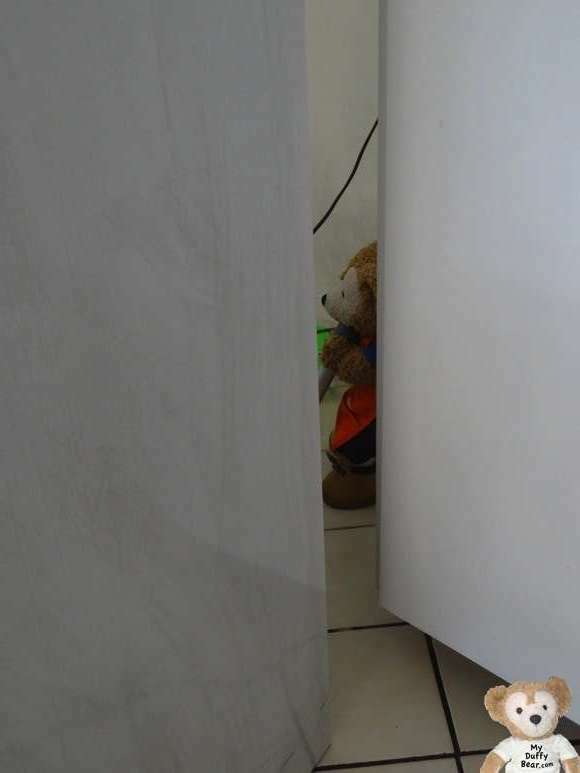 Mommy really said “Yes Duffy, you can be a big help today” with an enthusiastic appreciative smile. Only I really should have been suspicious of that smile when Mommy told me to go put on my Home Depot apron. Yet,…… kinda weird…….. Why would I need to put on my Home Depot Apron? Are we building the new refrigerator? I thought we were getting it from Best Buy. Mr. Tom is remodeling our bathroom and I put on my Home Depot apron when I do cool contractor stuff to help out with work like that……. This isn’t making any sense??? ………. Besides this is the Labor Day Holiday and Best Buy is having a sale. I thought holidays were all about humans shopping at sales, parties and food, and food, and more food! It’s a miracle this old thing is still working! 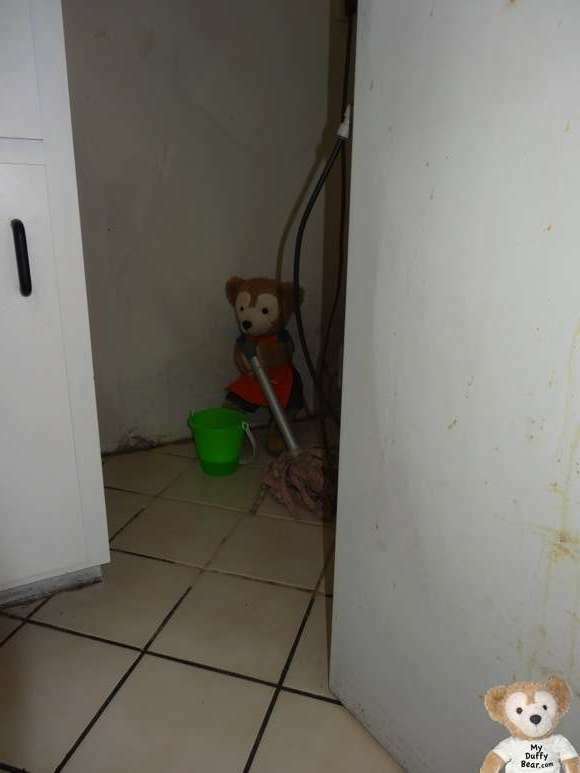 When I got back into the kitchen mommy handed me a mop and pail and sent me behind the old refrigerator to clean the dirty, grimy, nasty floor! Yet,…… I was the one that offered to help….. The tiles on our kitchen floor are white …….. the tiles under the refrigerator were black! Black and greasy and YUCKERS! Yuck! It’s pretty nasty back in here! Mommy heated up the water in the microwave so it was super hot before putting it into my bucket and she had some special lemony smelling cleaning stuff. I think I deserved a very beary special treat! or two or three! I hate to admit it,….. yet…. mommy was right… *gulp* Cleaning up the dirt was pretty simple. At least there was a cool part…….. 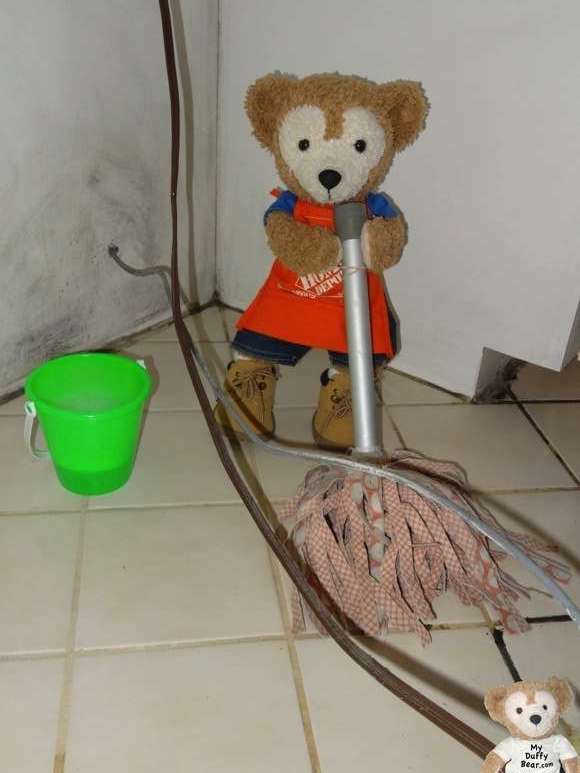 I liked the playing with the soap bubbles in the bucket with my mop! But I had to be very careful not to put my paw in the water so I didn’t burn my fur. 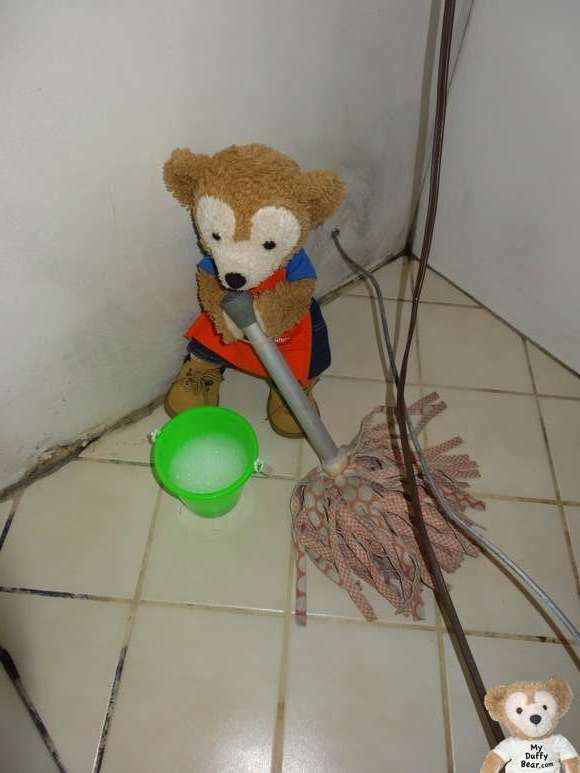 Actually, I kinda was laughing and smiling when I was cleaning. I was thinking about all the special treats I could ask for from mommy for helping out! Now….. for my treat! and I think I should get a super, really big special, scrump-O-nominally, duffer-D-lish-E-ous treat! 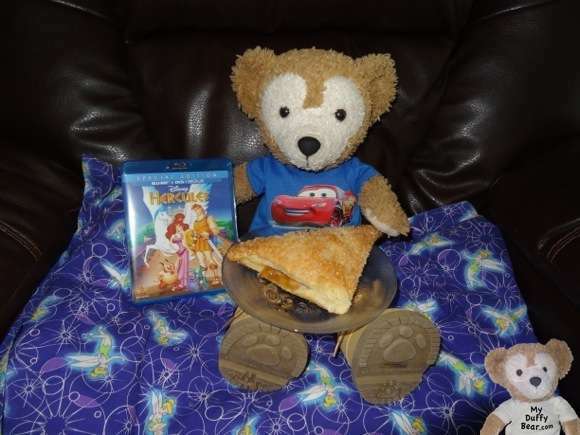 Apple Turnover and Hercules movie! Pawesome! Well furiends, I thinks I found the true meaning of Labor Day…. Tagged holiday, holidays, Home Depot. Bookmark the permalink. 29 Responses to Labor Day Surprise! I Get to Do What? It was the bestest! – We got another one – would you like to share? sorry you had to work buddy, but at least you got some treats out of it! Tks Ted, – I’m still trying to work this one for more treats! The part about celebrating after your labor was very wise! And you did look cute in your little apron and Duffy sized mop! did mommy pay you? I get paid when I do chores and stuff like that and such. Pay me? I wish! One of my Aunties gives me money. Mommy gives me treats and things – but no cash…… Maybe I need to ask? OMB! If I said that to mommy I’d probably be grounded for a week! Thanks! YES I DO! I just need to re-word that a bit. yes make a note or drawing explaining that bears need to get paid too! anybear we got Halloween shirts already they are very stylish. Mine glows in the dark! Oh! A drawing! Great idea! Halloween already? My brain gets so crazy when I think about what to be for Halloween! Glow in the dark shirts sound really cool! yes already ,mommies friend’s B-day is on Halloween so she gets candy presents from strangers. mommy still trick or treated before she got us! She is gonna be Anna from frozen! We’re watching FROZEN right now! My auntie got sick when we were at Disney on furday. Me & mommy are with her at the hospital now. They got some cool movies like BRAVE too! Gee – what a great day to be born! Free candy presents is one of my ideas of heaven! ShellieMay can’t decide between Anna or Elsa – I think she’s gonna choose Elsa. Me & Little Joe have a bet going. I love it when ABC family shows all the Disney movies! We so Tangled on Disney HD tonight too! yes me too! we watch Disney channel all the time and last weekend they played princess movies! ShellieMay, Springtime May and Mae Mae were glued to the Tv watching those movies! of course well good night! gotta get ready for school i just finished my home work and dinner. Hi – Dinner? I’m hungry again! Hi I activated my WordPress account and please check out my profile! I just checked…. duffernutterly great! Can you show your bigger or 17 inch gelatoni? Don’t you have one? I am very upset with this years Halloween TDS costumes seriously come on they just remade Shellie’s and made a boy version of it for duffies! I wanna see Christmas’ costumes now. They are usually better! Oh Christmas the cookies ,the movies ,the love ,the celebrations ,presents ,and best of all family time! I can’t wait! Hopefully the press release shows our costumes. Can’t you wait?!? !